Stroke is the fourth single largest cause of death across the nation, and second in the world. The UK is now home to over 1.2 million stroke survivors. These survivors are likely to live with the impact of what a stroke can have on a person’s life. Over a third are dependent on others for their daily care. There are a range of challenges that survivors face, such as difficulty in transferring between items of furniture, for example: on and off the toilet, problems getting in and out of baths and showers, altered visual perception, and feeling overwhelmed and psychologically confused. 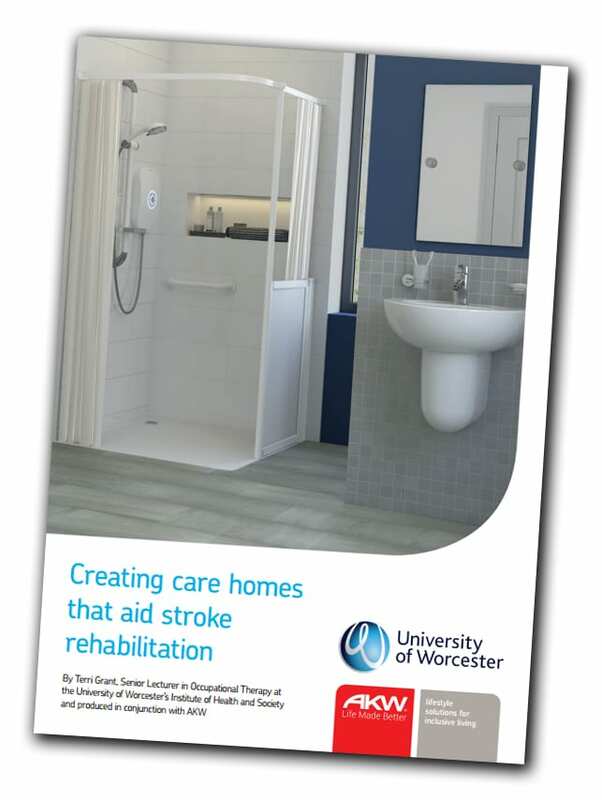 That’s why, here at AKW and in partnership with the University of Worcester and their Institute of Health and Society, we created the Guide to Creating Care Homes that aid Stroke Rehabilitation. With the help of Terri Grant, the Senior Lecturer in Occupational Therapy at Worcester Uni, we helped people to understand how important it is that we make designs which encourage rehabilitation and wellbeing. Our helpful guide includes design specification guidance to follow when designing bathrooms for stroke survivors, as well as bedroom design for a safe and comfortable space. The brochure consists of clear, short, and simple instructions, and provides tools to help the stroke survivor be as active as they can – which helps blood flow and results in a greater chance of recovery. We believe that it is vital to asses each individuals needs carefully and to adopt a person-centred approach to design; providing the best solution for them. If you adapt a room for a stroke survivor, you are not going to disadvantage other users. Since the design concepts generally make an area more accessible for most people and most abilities. Our guide that is so simple to follow and has potential benefits for all users of the newly designed bathroom. Enabling a stroke survivor to have increased independence and dignity in the bathroom is very possible, if you implement the correct ideas and focus upon the individual. If you’d are interested in downloading our brochure, you can request one here.